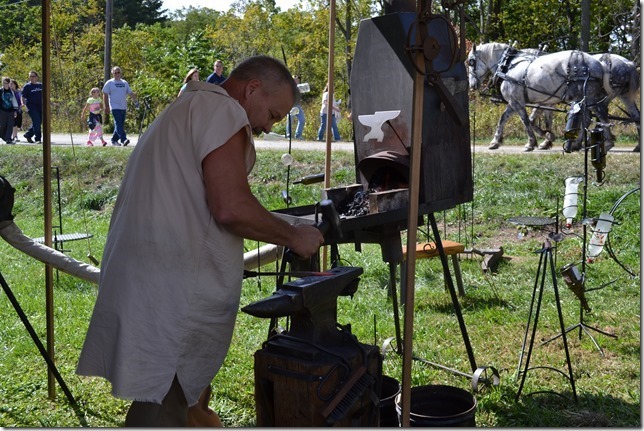 A blacksmith who let Emily blow the bellows. 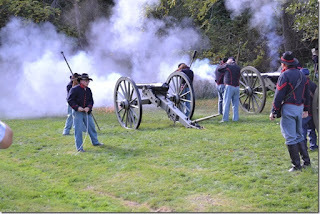 Civil War Soldiers firing the cannons. A log cabin and the Big House where Charles Bromfield lived. 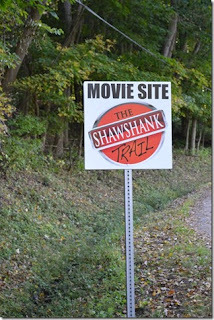 And a bit of movie history. We even took a horse-drawn wagon ride. 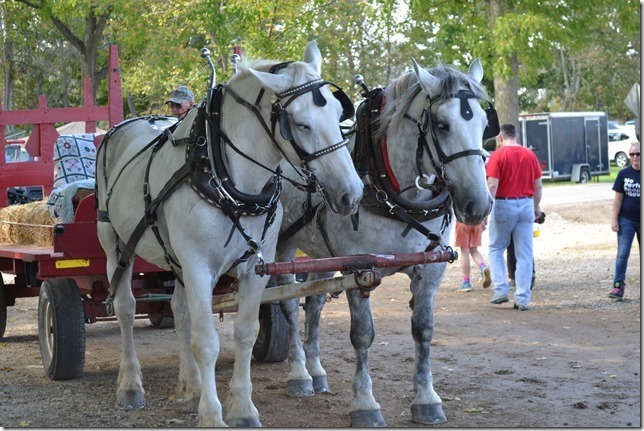 And all of this fun autumn entertainment made me want o read an autumn book. The book I chose was a super beginning science book called The Autumn Leaf. It is the story of a big oak tree who has arrived at the season of change and is loosing her leaves until only one leaf is left. Try as hard as she could, she just could not get that one last leaf to drop. The last leaf was scared to drop. 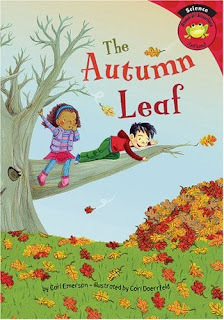 That is until some friendly children came up with a plan to help the little leaf overcome his fear and drop gently to the ground. 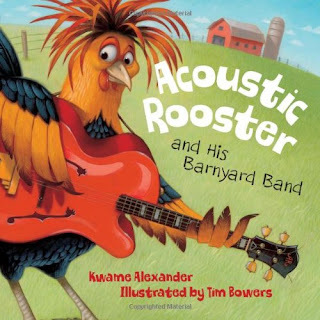 I also read a fun book called Acoustic Rooster which is the story of a musical chicken who starts his own jazz band in order to enter the farmers talent contest. He's the rockinest chicken around and even though he doesn't win first place, he has a great time. There are lots of references to past musical legends and in the back of the book there is a great glossary of musical terms, a page of the musical legends mentioned, and a musical timeline. So Many Good Things, And A Give-Away! It's always an exiting week when books arrive on my doorstep. This week was no exception when my friend Debbie Dadey's latest mermaid tale, Wish Upon A Starfish, arrived. This particular story is the tale of one mergirl's dream to become a star and the rocky road leading to stardom. I loved the characters, the oceany references to things familiar in the human world, and the homework the teacher gave the students to compare and contrast two sea stars. The homework part gave me a particular giggle because comparing and contrasting is exactly what we just covered in last week's English class. Debbie's colorful descriptions made me wish there really was such a place as trident academy. 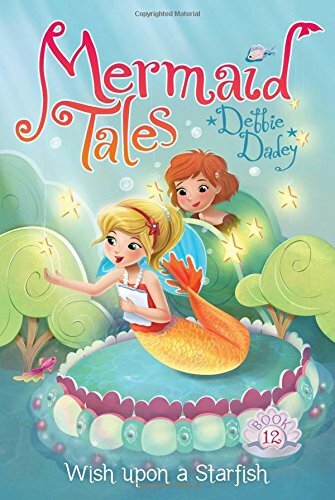 So if y ou have a little mermaid lover of your own, be sure to check out the whole Mermaid Tales Series! And as if that wasn't exciting enough, the twitter launch party for my new picture book, Quack and Daisy, started off with a splash and several fantastic reviews. Mom bloggers from Indonesia, the United Kingdom, and all parts of the United States shared their opinions of my story. 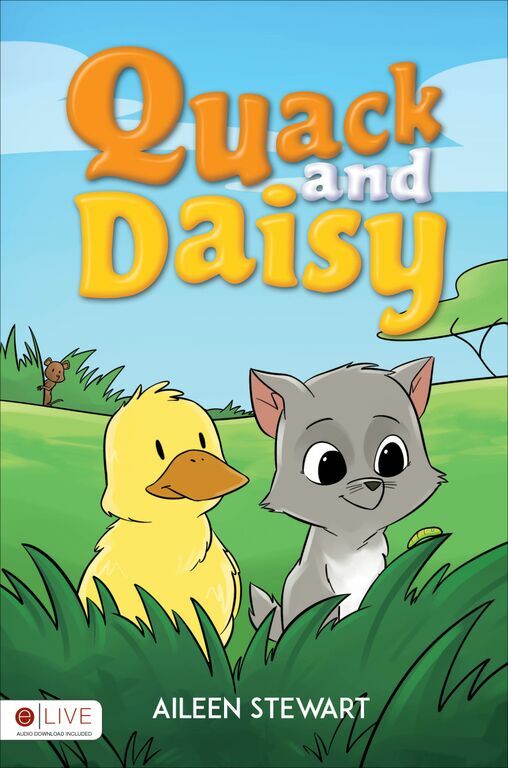 Blessedly, Quack and Daisy seems to be a hit so far. And for those of you who are fond of picture books, please join the fun and enter the party contest for a chance to win a copy of your very own! You can enter at my book launch coordinators site or anyone of the mom blogger sites hosting me. The excitement doesn't even end there. Today as you are reading this, I will probably be making my way to The Learned Owl Bookstore in Hudson, Ohio to meet the fantastic Drew Daywalt in person and to pick up an autographed copy of his new book, The Day The Crayons Came Home. 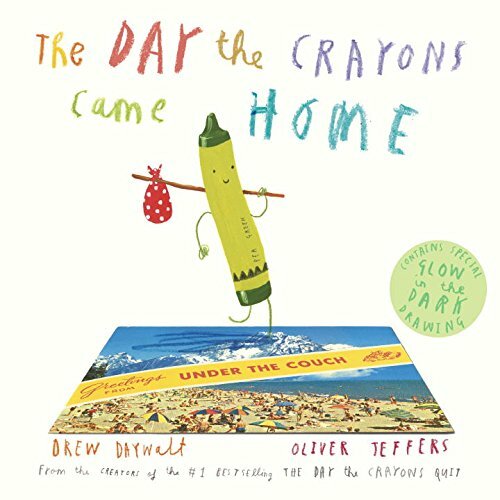 Labels: book give-away, Debbie Dadey, Drew Daywalt, ducklings, friendship, kittens, Mermaids, Quack and Daisy, The Day The Crayons Came Home. 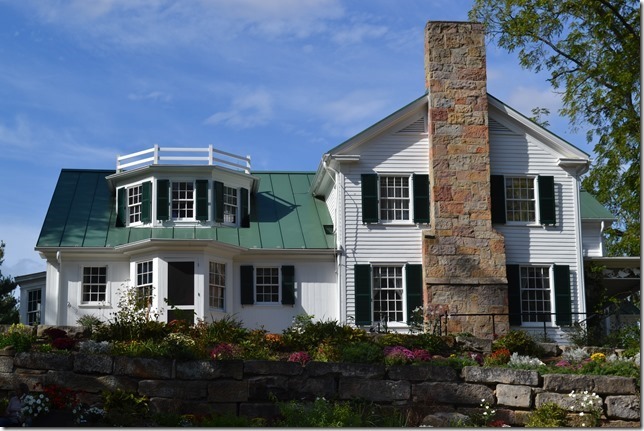 A Scavenger Hunt, A Field Trip,and Some Good Books! This past week was another one of those really busy but fabulous weeks. Emily and I started the week with our normal home school lessons, but on Tuesday, we attended Cookbook Club. The theme was salads; but I don't have many salad recipes, so I made Creamy Broccoli Noodle Soup, and Emily made Cheesecake Cups. On Friday, we took another break from normal lessons and took a field trip to the Gorman Nature Center where we had a picnic and a scavenger hunt that we printed off from the Discover The Forest Book of Stuff to Do. Our most recent science lesson of the week had been about soil, so it was also great fun to see first hand decaying organic matter in the form of a rotten log turning into humus. We felt it. We smelled it. It did indeed feel and smell like a pile of dirt. 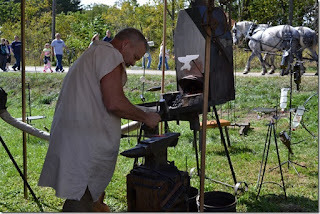 Saturday found us at the Farm Market as usual where it was a bit slow and a bit nippy. So in between sales, we watched as they prepared to tear down a historical building on the corner that had recently shifted and posed a threat. And I rounded the week off by testing my new vacuum. It is my first ever bag-less pet pro vacuum, and it worked so well that after vacuuming only one room and the back of the couch, I had to empty the canister. I am so excited to finally be able to keep up with the daily shedding of three cats! So, in honor a very good week full of great lessons and filed trips, I read three book that are super for the pre-k youngsters. 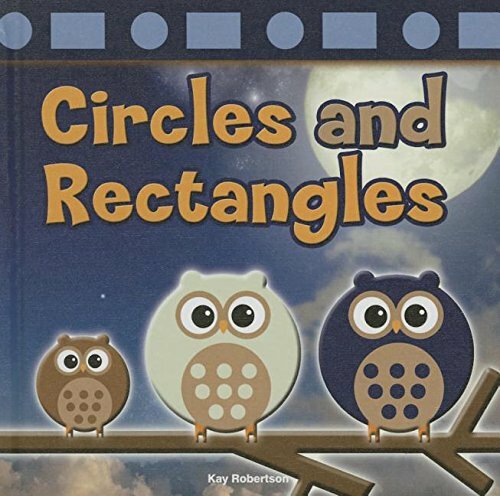 The first two are shape books by Kay Robertson, who if I am correct is the same Kay Roberson of the Duck Dynasty. 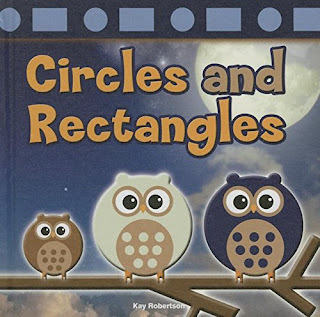 They are: Circles and Rectangles and Squares and Triangles. 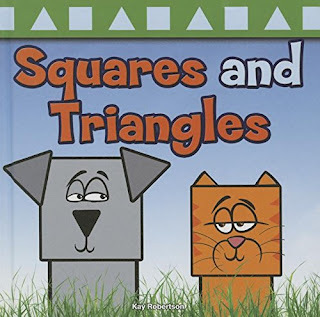 Each book describes the two shapes contained on the pages and then goes on to describe things that can be made from different combinations of those shapes. These books seem to me to be perfect for teaching youngsters about shapes in a fun and engaging way. 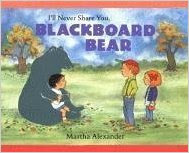 The third book I read was called, I'll Never Share You, Blackboard Bear. It is a fun story about a boy with a bear drawn on a blackboard. His bear comes to life and two other children see the bear and want one of their own. The young boy does not want to share his bear, but the bear convinces him that sharing can be awesome! This book contains a great non-preachy lesson for the very young. It seems to be out of print, but perhaps you can find a copy at your library like I did. This past week was exciting in more ways then one. First of all, we started our second year of homeschooling. We are a bit busier this year since we home school through our former school's Independent Studies Program which allows Emily to participate in the fifth grade choir. We also fulfilled a longtime dream of Emily's which was to own a piano. 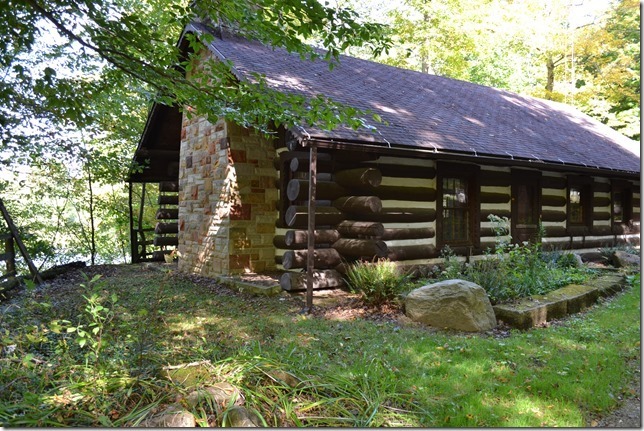 Some friends of ours were getting rid of a small spinet piano, and we were able to purchase it fairly inexpensively. 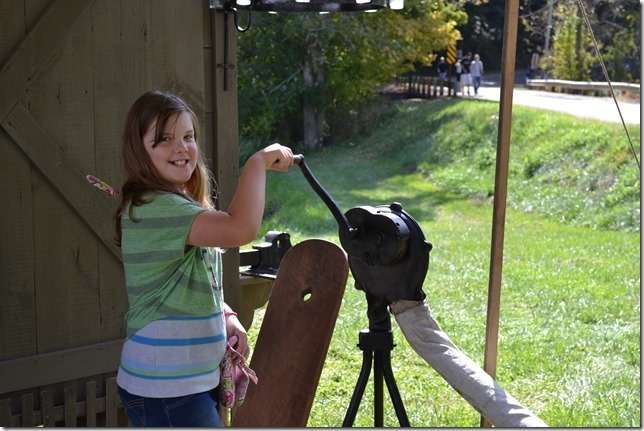 Her aunt has agreed to teach her the basics, and she is very excited. I'm not sure yet if she grasps the concept of how much hard work learning to play the piano is going to entail, but for now we are just enjoying the new piano euphoria. And speaking of dreams, Brown Bear had a dream too. In Brown Bear's Dream, Brown Bear Dreams of visiting the sea. However, an injury to his leg keeps him from being able to walk to the ocean. So Brown Bear thinks perhaps he can learn to swim and can make his way to the ocean in that manner. 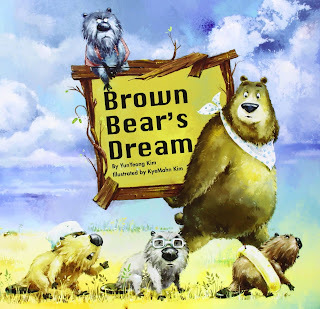 His good friend, Grandfather Beaver, helps him set goals, encourages him to continue working at accomplishing those goals even when they become difficult, and shares part of Brown Bear's journey with him. And although the journey was long and difficult, Brown Bear actually accomplished what he set out to do. I can't even begin to tell you how much I loved this book. I saw myself in Brown Bear where my writing is concerned. 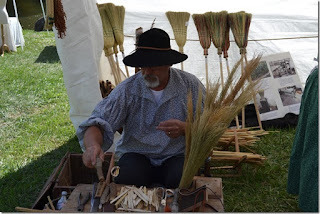 I have a dream of where I want to end up on my writing journey, and although I haven't yet achieved my dream, I am bolstered by wise Grandfather Beaver's words, "This is your dream! Keep working at it. It is never easy to realize a dream. If it was easy, it wouldn't be worth having." The second book I read was about what to do if a dream doesn't work out quite the way you plan. 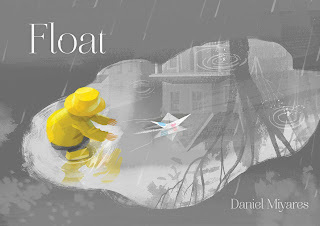 The book is the new wordless picture book, Float, by Daniel Miyares. A young boy takes a paper boat out for an adventure on a rainy day. What happens to his boat isn't what he had in mind when he started on his journey, but when things don't go as he hoped, he learns that there is always a plan b.